A good rule-of-thumb is to replace your filter every 1–3 months. That said, some filters need to be changed more frequently than others because they get dirtier faster. The important thing is to change your AC filter before it gets clogged with dirt and debris. In this blog, we’ll share how to tell exactly when you should change your filter. Need a pro to help you change your filter? 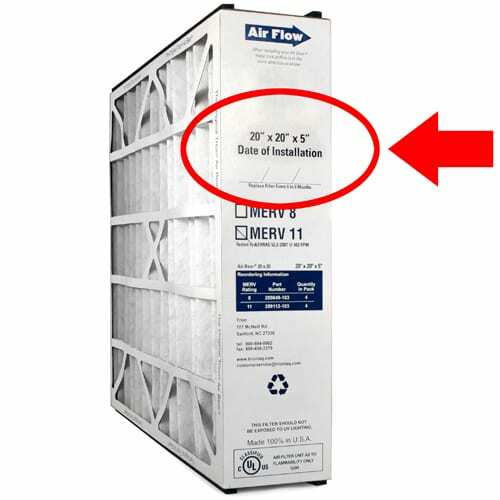 An air filter’s MERV rating will indicate how often you need to change your filter. MERV (Minimum Efficiency Reporting Value) is a rating that tells you how effective an air filter is, or more specifically, how well it can catch particles in your home’s air. The higher the MERV rating, the more effective the filter. Generally, low-MERV filters can last longer because they don’t collect as many particles as high-MERV filters. Note: These recommendations assume your air filter is less than 2 inches thick. If you have a filter thicker than 2 inches (which is recommended for most MERV 8+ filters), you can usually wait longer to replace your filter. Most manufacturers will include the MERV rating and dimensions of the filter on the long side of the filter (see an example here). Sometimes, instead of “MERV 6” the filter might just say “M6”. Can’t find your filter’s MERV rating? Contact a professional for help. If you want to avoid the hassle of changing your filter, consider joining our Pro Plus Advantage Member Plan. When you join our Pro Plus Plan, we’ll check your filter for you during a routine AC check-up. If your filter is dirty, we’ll replace it for you. Should I Get My Air Ducts Cleaned? A San Antonio Duct Expert Answers.